With eleven premium bandwidth providers delivered through two diverse points to our private datacenter, our 100% uptime network provides the performance and reliability that you expect for your hosting infrastructure. Redundant Juniper routers direct traffic over our private fiber optic network, delivering it to your servers on Cisco’s 6500 series switching platform. In addition, a partnership with Internap provides routing optimization that reduces network latency by up to 50%. Traditional networks are managed using BGP, a protocol that attempts to improve network performance by measuring the distance (number of hops) between the end user and the server they are accessing. The shortest distance between two points is not always the fastest. 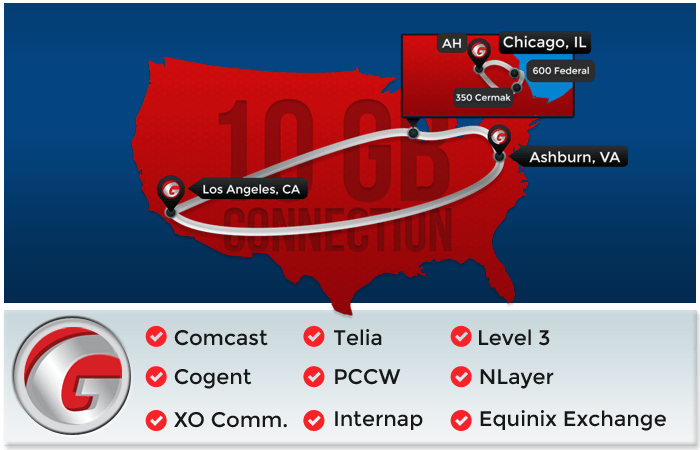 Utilizing Internap’s FCP-10Gx routing optimization applicance, every path out from our network is continuously monitored for latency, packet loss, route stability, and congestion. This method of routing optimization ensures maximum network performance. Continuously monitors every outbound route for latency, packet loss, route stability, and congestion. Automatically routes traffic around major network outages. Manages network issues such as IP network brownouts. Proactively identifies and chooses the best path at all times. Test our Network from any location.